Population and Housing data are important parts of ocean and coastal economic picture. Like employment, wages and GDP, the growth or decline in population and housing is an essential measure of economic health. 81.4% of the population lives in coastal states on 57% of the nation's land area. 37.4% of the population can be found in counties adjacent to the oceans and Great Lakes. These counties occupy less than 18% of the land. Population densities continue to grow highest in coastal states where dependence on ocean resources are greatest. 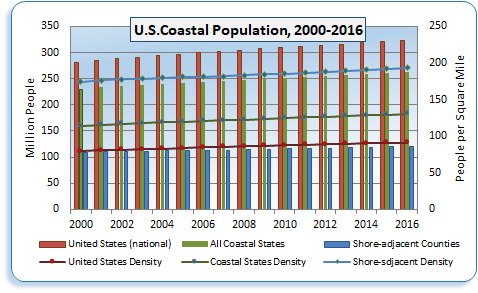 The coastal states population density in 2016 was about 130 per sq. mile while non-coastal states average density was 39. Shoreline counties had about 193 people per sq. mile; however the nearby non-adjacent Coastal Zone counties had a population density of over 306, an increase of 52.7 people per sq. mile and a growth rate of 20.8% since 2000. Overall U.S. population growth for the 16 year, 2000-2016 period was 41.7 million people. 79.3% of the growth occurred in the coastal states and 29% in shore-adjacent counties. Of the 135.7 million U.S. housing units in 2016, 81% were in the coastal states. The overall density of U.S. housing units was 38.4 per sq. mile. For coastal states, the density was 54.3, compared with a housing density of only 17.2 for non-coastal states. While the shore adjacent counties show a high density of 82.1 per sq. mile, it is the nearby non-adjacent coastal counties that hold the highest density of 123.2. Of the 19.8 million U.S. housing units added between 2000 and 2016, 79.1% were in coastal states and 30.3% were in shoreline adjacent counties.